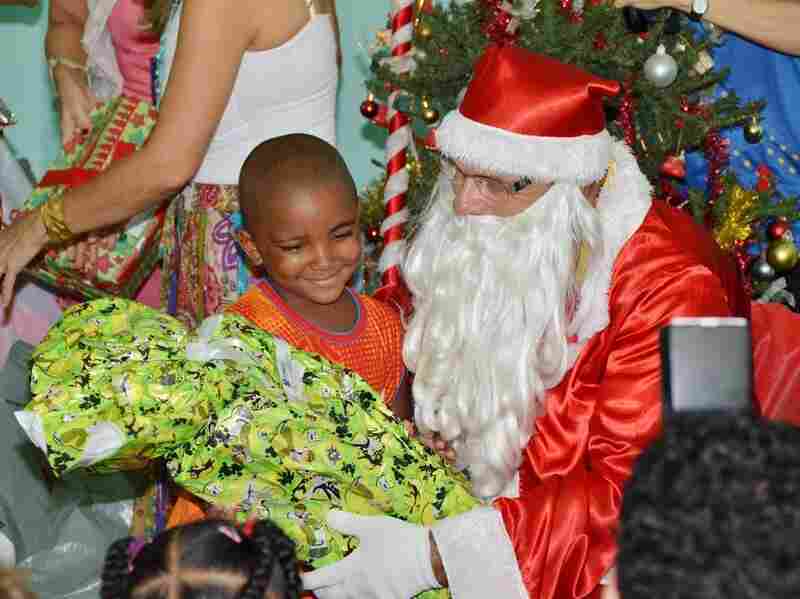 Brazil's Post Offices Help Deliver Christmas Wishes : Parallels It's a cross between Secret Santa and Make-a-Wish. For more than 20 years, ordinary Brazilians have read letters addressed to Santa that end up at their local post office and helped fulfill those wishes. The Father Christmas Project helps about half a million kids, some of whom ask for basic things like food and beds. 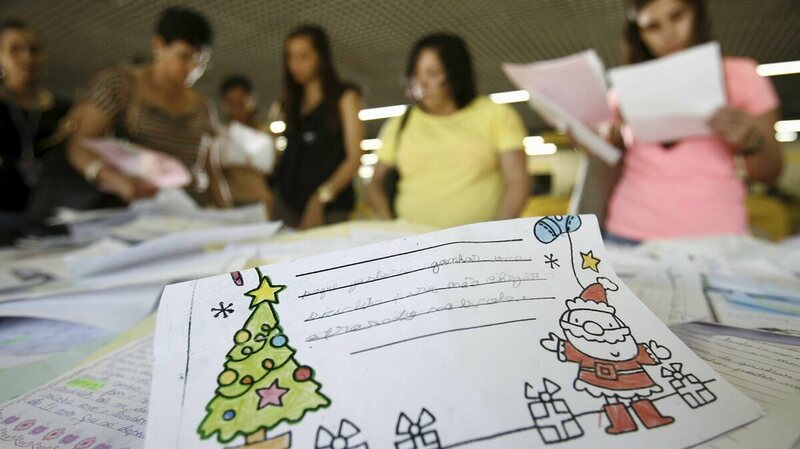 Volunteers look through children's letters to Santa at a post office in Salvador in northeastern Brazil's Bahia state. The campaign is part of a more than 20-year tradition to help those less fortunate to have gifts for the holiday. "Dear Father Christmas," the letter reads, "my name is Larissa. I know that you are very busy and that you live a long way away in the North Pole, but I'd like to ask you for a gift because my mother doesn't have enough money to buy what I want." There are piles of similar letters — many decorated with stickers, drawings and hand prints — lying on makeshift tables in the main hall of the post office in downtown Sao Paulo. Another letter, this one from a 10-year-old boy, reads: "My mother died when I was a young baby. I live with my brother and my father. But this Christmas he can't work because he's in the hospital." A group of women sift through them, looking to choose one. Sonia Regina de Sa, a nurse's assistant, says she's been doing this every year for nine years. A man dressed as Santa Claus, representing the Brazilian postal service, distributes gifts donated to needy children in a public elementary school in Salvador, Brazil. "I really love it," she says. The way it works, de Sa says, is that you come here, read the letters and look for something that really affects you. Then you buy the gift that the child asks for and bring it back to the post office, where staff wrap it up and deliver it to the child. Most of the kids ask for dolls, balls, bicycles — the usual array of toys. But some letters, she says, ask for heartbreaking things. This year, de Sa says, she chose an 8-year-old boy who was asking for food. He didn't want toys; he wanted food for his mother. "It's something that just shocks you, and it makes me sad, too," she says. Other letters have asked for help for crack-addicted parents or jobs for unemployed relatives. Elizabeth Aragao says she always chooses gifts for small children. "I cry reading the letters," she says. "We try and help a little. If everyone helped a little, the world would be a better place." And that is the idea behind the program, which is sponsored by Brazil's post office and has been going on for more than 20 years. Wilson Abadio de Oliveira, the director of the post office for metropolitan Sao Paulo, says the campaign began through the initiative of postal service employees. "They were receiving letters from children addressed to Santa Claus in the North Pole, and the workers started opening them and reading them," de Oliveira says. "They started buying some of the gifts the children asked for, and we thought what a great idea. It then was adopted officially by the post office." De Oliveira says 1 million children across Brazil now write letters every year, and about half of them are adopted by someone. The post office ensures that the letters come only from children under 10 years old with verified addresses. And the letters must be handwritten; he says it's a way of also making sure kids improve their writing skills. Every year the Father Christmas Project is a big operation nationwide. Tucked into the bowels of the Sao Paulo city post office, employees sift through letters, making sure all the information is there: name, age of the child and gift of choice. The letter then gets registered in the computer, and a number is attached to it. At the end of the process, the letters go down to the main floor to be "adopted." "My name is Papa Noel," says the man dressed as Santa sitting on the main floor greeting children. His presence is part of the project. He acknowledges that he is a post office employee, but he refuses to go by anything other than Father Christmas to a visiting reporter. While most of the gifts bought through the program are delivered by regular letter carriers, sometimes Papa Noel, in full regalia, makes a special visit to someone's door. "The whole point of this is to keep alive the spirit of Christmas inside our children," he says. "But this isn't only for children. It's a way for people to help each other. That is what this season is really about." We go with one of the deliveries to a favela, or shantytown, not far from the post office. We stop in front of a shack; it's made of cardboard siding and tin, crowded among other makeshift dwellings. Maria Marisa Laureano answers the door. Her daughter has asked for three beds for her and her two sisters. When we go into the one-room home, we see only one large bed where Laureano says she and her children all sleep. A pot of food is cooking in the corner, and clothes are strewn on the floor. It's dark and crowded, and the walls are so thin you can hear the neighbors talking. The new beds barely fit in the house. Laureano says they are hoping to move. "It's been three months since I moved here," she says, "but there are a lot of termites. Some nights we can't sleep. They fly and walk on the bed, on us, they bite. Life has been very hard." "We wrote a letter but we didn't know if we would get anything. I don't even have words," she says. "I thank Father Christmas a lot."